With all of our family on the mainland, our Thanksgiving gatherings in Kauai certainly qualify as “Friendsgiving”, though we do consider our friends here to be family. This year a dear friend Robert from California came for a visit and I was able to share a couple of my favorite places. We took a walk through National Tropical Botanical Garden. It's a must see when visiting Kauai. My favorite "room" in the Allerton Garden is this Mermaid fountain. If you sit on the bench at the end of the fountain your heartbeat will adjust to the sound of the fountain. Very relaxing. Many artists have found inspiration in this fountain. Including Mike Robles from Livermore, CA. 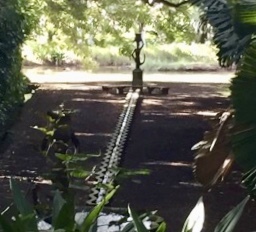 He painted this fountain on a jeroboam bottle and it went for a lot of money at the annual NTBG Gala auction. One of the guests loved the art and then commissioned Mike to do a painting of the fountain for his house. Both the bottle and the painting are quite beautiful. 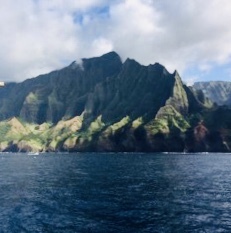 Later that week, we took a boat up to NaPali, the northern coast of Kauai. No roads up there. It was spectacular that day. No waves, just beautiful ocean and the occasional whale and dolphin. Here are some pics I took of that outing. I've been up there a dozen times and never get tired of the scenery. It's the most photographed place on Hawaii. Sunset was behind some clouds but still gorgeous! We were lucky to have made the trip when we did, as the very next day a twenty foot swell arrived from the north bringing thirty to forty foot waves. Even the Jaws surf contest in Maui had to be cancelled because of the size of those monsters. Take care everyone, happy holidays, and of course….. Aloha!